So who is Pauline Hanson, the woman and politician? Does she really stand for the battler, or has it only ever been about her personal pursuit for power and infamy? Has she duped her loyal supporters, who have kept her in the public eye and propelled her back into parliament because she 'speaks for them'? Pulling no punches, and with a finely developed sense of the absurd, Kerry-Anne Walsh's conclusion is an emphatic yes. Through all the ups, the downs, the downs and the ups, Kerry-Anne probes and prods the evidence to uncover the many faces of Pauline Hanson: her time as an accidental local councillor, her emergence as a surprising national figure in 1996 and her resurrection in 2016, her careful profile-building through the media during the intervening years, the friends she's used and discarded, the men who control her, the money trail of her party and her personal finances. And then there's the rise and rise of the disaffected voters who now control political destinies, and the collapse of trust in the system that has allowed chancers such as Hanson to flourish. 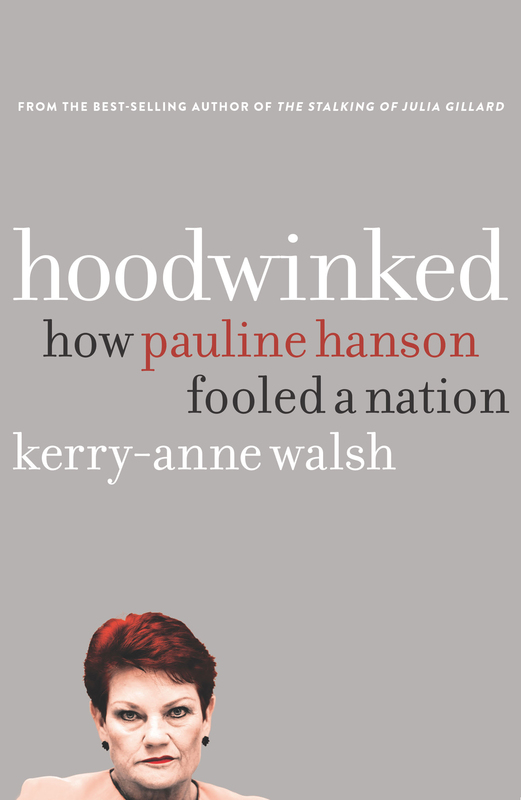 Perceptive, surprising and revealing, get ready for Hoodwinked to take you on one wild ride. Kerry-Anne Walsh was in the Canberra press gallery for twenty-five years occupying senior posts in print, radio and TV. Disenchanted with political spin and the nature of political reporting, she left the gallery in 2009 to establish her consultancy KA Communications. Her book The Stalking of Julia Gillard won the 2014 Australian Book Industry Award for the best non-fiction book of the year. Kerry-Anne and her son Kieran live in Canberra, and she continues to be a keen questioner of Australian politics.